April is a time for renewal with fresh education themes blossoming all around us. This week we turn our focus on April celebrations including National Poetry Month, Math Awareness Month, and Month of the Young Child. In one convenient place, Math at the Core provides educators with a group of interactive activities, lessons and videos to help students deepen their math practice. > Looking for math activities for elementary school? Set your sights on MathLanding. In April we recognize that the early childhood years lay the foundation for children’s success in school and later in life. 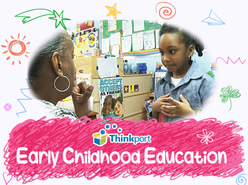 Parents and child care providers can find a wealth of early education activities on Thinkport to inspire and enhance early learning. Our collection of PBS KIDS interactives cover skills in math, science, STEM, literacy, and social and emotional development. Learning happens everywhere, it doesn’t stop at school. Our afterschool and summer adventures help children practice early math and literacy skills using media and content from PBS KIDS programs. Robert J. Marzano discusses a shift from a teacher-behavior perspective to a student-outcomes perspective while addressing a wide range of instructional strategies. How can eduators avoid professional development that is “one size fits all?” PBS LearningMedia explores the digital age tools and platforms that can help you share strategies with your colleagues to establish a professional community of peers. See the city transform into a world class light display! A spectacular event is coming to Baltimore City bringing with it stunning sculptures, interactive technologies, and a festival of entertaining activities. Washington Parks & People received a $2.7 million stimulus grant to put long-term unemployed residents back to work through a new green job training program. MPT airs this deeply personal story about the fight for good jobs and safe parks in our nation's capital. By observing their environments, neighborhoods, and collecting information about the world, so-called “citizen scientists” are helping professional scientists to advance knowledge while speeding up new discoveries and innovations.